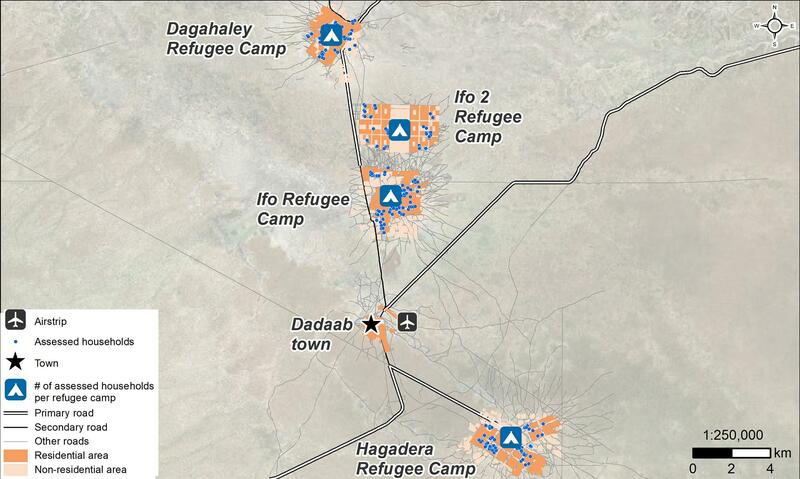 Dadaab is a semi-arid town in Garissa County in Kenya hosting refugees in four camps (Dagahaley, Ifo, Ifo2 and Hagadera), witnessing at the same time large-scale departures and returns of Somali refugees over the years. On the one hand, the Dadaab refugee population has been slowly reducing through voluntary repatriations, with over 70,000 Somali refugees returning to Somalia since 2014 according to UNHCR – half of which in 2017 alone. On the other hand, prevailing drought conditions and renewed conflict in Somalia once again led to large scale displacement and spontaneous cross border movements back into Dadaab throughout 2017. While the deterioration of the situation in Somalia has heightened protection concerns for cross-border movements, hindering international standards of safe, dignified and sustainable return, in parallel registration and refugee status determination processes for both new arrivals and returning refugees in Kenya have been interrupted, significantly impacting their ability to secure their status as refugee and access essential services in Dadaab. In this context, REACH in partnership with the Norwegian Refugee Council launched assessments to understand intentions of movement, access to services and assistance in Dadaab, informing more tailored aid interventions in Dadaab and cross-border programming related to Somali refugee returns. Quantitative household data collection and key informant interviews conducted by REACH were complemented by secondary data analysis from previous assessments from partners. While a small number of the assessed households stated they were certain to return to Somalia, approximately half reported that they will not return, mainly due to fear of conflict and drought in Somalia. 14% of assessed households reported having members that had already returned to Somalia, due to the potential Dadaab’s camp closure, and half of these returnees did not register for the voluntary repatriation programme, mainly to not lose their refugee status. Moreover, 9% of the assessed households were not registered in the camp, likely exposing them to increased vulnerability and protection risks, and side-lining for services and assistance in the camp. As the situation in Somalia remains volatile, REACH will continue to provide an in-depth understanding of the conditions, needs and intentions among the residents in Dadaab camp and to provide information on service availability in Dadaab and areas of potential return in Somalia to the refugees to ensure they make informed decisions on their future. Dadaab movement and intentions monitoring factsheets of November 2017 can be accessed here for Dagahaley, Hagadera, Ifo, Ifo 2 and Dadaab. For more information, please have a look in the REACH resource centre. ← Previous Previous post: Niger: How did protection needs of displaced populations evolve throughout 2017 in the Diffa region?